CIVIL SERVICE STROLLERS manager Gary Jardine has bolstered his team’s chances of securing a top-four place by securing deals for two players. The Muirhouse club struck a deal earlier this week to bring in former Vale of Leithen player Kerr Allan, who recently became a free agent, and they have managed to extend goalkeeper Josh Donaldson’s loan from Dundee United until the end of the season. Allan, a 22-year-old central midfielder, spent just under two seasons at Victoria Park where he was a mainstay under the mentorship of Innerleithen boss Chris Anderson. Now the Spartans Community Football Academy coach will look to force his way into a Strollers side that are unbeaten in their past seven games and haven’t tasted defeat since the beginning of November. Speaking ahead of tomorrow’s encounter with Gala Fairydean Rovers, Allan said he cannot wait to get started. Donaldson has made a significant impression since joining fourth-placed Strollers initially in December, recording a clean sheet on his debut against Edusport before helping his team-mates draw matches against Spartans and BSC Glasgow. The 18-year-old will now look to continue his development until the end of the campaign. Jardine, pictured, was delighted to strengthen his squad in the areas he had targeted and spoke highly of his new recruits. “Kerr is a player I’ve been aware of for a few years and for someone still relatively young he’s gained good experience over the last four years at Leith, and latterly Vale. He added: “I’d watched Josh (Donaldson) in a reserve match for Dundee United and didn’t realise he was only 18, such was his confidence and organisation qualities. “He’s already a top goalkeeper who I’m sure will go on to to have a good career and hopefully gaining first-team experience with us will stand him in good stead. Elsewhere this weekend, Spartans will travel to South Lanarkshire to face league leaders East Kilbride desperate to prevent the hosts posting an 11th league win on the bounce. Kilby have been in scintillating form of late, stretching nine points clear at the top of the table and will look to record their sixth clean sheet in row against Dougie Samuel’s side. 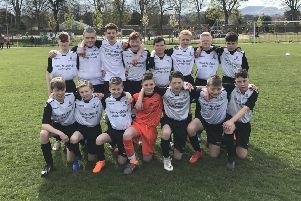 Basement boys Whitehill Welfare entertain East Stirlingshire at Ferguson Park, who themselves have endured a disappointing campaign. Ian Little’s side have shown glimpses of a possible revival in recent weeks and victory over Shire could move them within touching distance of second-bottom Dalbeattie Star who face a tricky encounter against Kelty Hearts. The Rosewell outfit have brought in reinforcements with midfield duo Ainslie Hunter and Anthony Laing joining the club. Edinburgh University are also in action and they shall welcome fellow strugglers Gretna 2008 to East Peffermill. Dorian Ogunro’s men slipped to their seventh straight defeat last Saturday but the Students will view this game as an ideal opportunity to arrest their slide.